This vase shows a Maya ruler sitting cross-legged on a bench, wearing an enormous headdress to show that he is important. He is pointing to a basket full of corn bread gifts called tamales. This vase illustrates the delivery of a tribute, with glyphs naming the figures whose jewelry and turbans identify them as members of the Maya elite. The six hieroglyphs in boxes to his left list his name and titles. The Maya had begun to write as early as 400 B.C.E., but from the sixteenth century Spanish missionaries destroyed their codices (screenfold books) and made them learn the Spanish alphabet. As a result, the Mayan language was lost and there was no way of deciphering the glyphs on their monuments or the handful of codices that survived. In the eighteenth century, however, European travelers began to rediscover the Maya civilization. In particular, the publication of Antonio del Río’s report on his expedition to the ancient city of Palenque (1787) included the first illustrations of Maya script carved on stone monuments. By the early nineteenth century, European scholars were beginning to recognize that Maya glyphs were a writing system. They made efforts to record the glyphs in drawings, engravings and casts, and collected vases and other artifacts with glyphs on them. The first European to accurately depict Maya glyphs was Alexander von Humboldt (1769-1859), who illustrated pages from the Dresden Codex in 1810. But, scholars did not finally understand the meaning of Maya glyphs until the twentieth century. 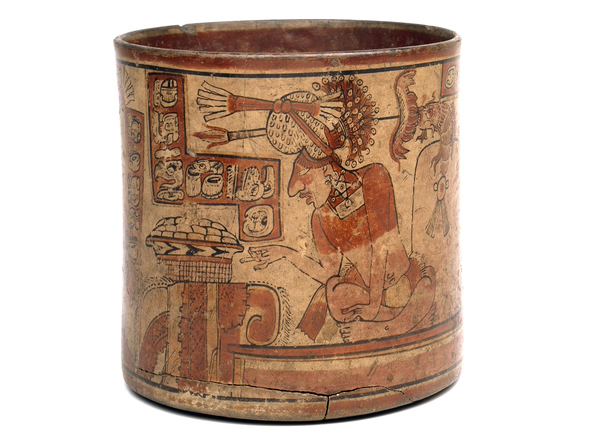 Polychrome ceramic vessels were a symbol of status and power for the Maya. They were used by the élite and are found as offerings in rich burials. A large number of beautiful polychrome vases, bowls and dishes from the Late Classic period have been recovered from the Maya area, at sites such as Tikal, Holmul and Seibal in the lowlands, and Nebaj in the highlands. The vessels provide an important source of information about Maya society in the Classic period, with text and images illustrating historical and mythological events. The scenes depict scribes, merchants, rulers and other members of society. This beautiful example was found at Nebaj, a Maya site in the highlands of Guatemala. The most common themes on Nebaj style polychrome vessels are tribute and warfare. D.R. Budet, Painting the Maya universe (Durham, London, Duke University Press in association with Duke University Museum of Art, 1994). M. Coe and J. Kerr, The art of the Maya scribe (London, Thames & Hudson, 1997). K. Sloan with A. Burnett (ed.). Enlightenment: Discovering the World in the Eighteenth Century (London: The British Museum Press, 2003). M. Coe, Breaking the Maya code (London, Thames & Hudson, 1992). L. Schele and M.E. Miller, The blood of kings (London, Thames & Hudson, 1986). R. Sharer, Daily life in Maya civilization (London, Greenwood Press, 1996). Cite this page as: The British Museum, "Maya: The Fenton Vase," in Smarthistory, March 1, 2017, accessed April 20, 2019, https://smarthistory.org/maya-the-fenton-vase/.